I finished these a few minutes ago and grafted the toe. I really enjoyed this pattern from Ailsa. It was easy and quick as the pattern rows sped by. I had put them aside for a few days to do the shawl shown below but it took only a little while to do the last few pattern rows, then the toe. I'm considering doing the pattern again on some grandchildren socks. It's a 12 stitch repeat so I could do it on the leg and make the foot plain, unless I chopped the pattern short which I'm reluctant to do. Good news about my little granddaughter who saw the oncologist this morning. The family doctor had told her parents that things such as she had which were on the sole of the foot were always malignant. I think he should have been less hasty in his speaking like this. It was a very deep seated blood blister possibly caused by landing heavily on a stone. There was no lump to be felt, it was so deep and she had no pain. He took off top layer, she thought he was tickling her foot and scraped it out to prove his diagnosis. I always felt she would be fine, but nevertheless, it's a relief to hear what it was . I decided I'd make another shawl with the beautiful sockwool, colour Sacred Forest, from Ailsa, Knitabulous. This wool is the first instalment in her second yarn club, accent this time on Japan. As I wasn't sure of time frame involved, I've concentrated on this over the last three days. It's to be a gift to a friend in Canberra. I had asked this friend for some patterns and hints as I wanted to make something another friend needed. In return, she has offered to make all items and refuses any payment for them. So friend and I decided to give her something. An almost simultaneous decision, by the way. He asked for ideas and when I said that friend who is originally from Townsville, hates the winter in Canberra, the decision was easy. We had thought of book, gift vouchers, dinner voucher and other things. However, Ailsa's lovely wool has turned into a small shawl, large scarf. It's soft and cosy but very difficult to photograph. The top photo is of dry shawl still pinned to blocking blanket but now pegged on the line. It's very hard to see the subtle colour changes, although the actual pattern cane easily be seen. Sometime after I made the first Milkweed shawl, I found a photo of the plant. The shawl pattern is very true to the form of the plant. The second photo is on lounge in sunroom opening off Dil's and son's room. Again, I found it difficult to show colour changes. With this now done, I can concentrate on finishing the Mountain Fold socks, also from Ailsa. I'm very nearly down to the toe decreases in the second sock. Next project after that will probably be some wristwarmers for a friend in chilly Mallacoota. Anzac Day again, so soon. A day to remember those gone before, those who served in many theatres of war, those who still serve overseas in places of great danger. I prefer to take a simple view of the day. I'm not one for talking about the birthday of a nation or other such ideas. I think it good that we teach about the horrors of war to the younger generation. Methods of warfare have changed much since 1915, but the horror is still there, man's inhumanity to man, as Shakespeare called it. I've never attended a Dawn Service and it's a while since I've attended the march in Sydney. I think these are both good things to happen. What horrifies me is the increasing commercialism of the day. An Anzac day sale? Hideous, as is the Anzac day football match with its emphasis on selling tickets. Emphasis perhaps on making a profit, rather than on the fleeting acknowledgment of the day at the beginning of the match. Anzac day has always been celebrated solely on its actual date. This year there is a public holiday Monday. Just so wrong in my opinion. Any excuse for a bludge. My most memorable Anzac Day was spent in a very small Central West country town, village rather. Every male gathered outside town and marched, rather walked, some were quite elderly into town to the war memorial that most villages subscribed to after WWI. They gathered in the sun, veterans, old men, those from other wars and those too who had never enlisted nor needed to. Children hung around on the outside of the group and a few stray cattle dogs and kelpies sniffed around the actual memorial. Patients from the tiny local hospital struggled out to swell the size of the small group. There was a short but moving service, then as one, the ranks formed again and they marched off leaving the dogs to anoint the memorial obelisk. This beautiful wool is Ailsa's first offering in her second yarn club. In real life, it's a little darker than shows here. The first club had an Indian theme. This one has a Japanese theme. The wool is lovely, similar to the yarn I used for her February Baby Sweater test knit a couple of weeks ago. There's 115 gm in it, although when I weighed the ball after winding, the scales consistently said 127 gm. The colours are beautifully blended. She's called it Sacred Forest. There are shades of brown, dark brown, bronze and a couple of muted greens. I love it. I'm going to be using it for a Milkweed shawl, my second. A friend of mine is doing some work for another friend. Quite a lot of time and effort involved in an area of work for which she would normally be paid. She totally refuses any payment absolutely. So this lovely yarn will help keep her neck warm in the Canberra winter. I'll be knitting much of today on this so my friend can see it when he calls after supervising St John Ambulance volunteers at the Anzac Day March. It won't be finished but will be well on the way. I did the first chart last night. She comes from North Queensland and hates Canberra in wintertime, so this may help. Perhaps I should have kept this for Shoes-day? LOL. These are really a deep maroon colour, although they look a dark brown here. The inside picture shoes the colour better than the pair I'm wearing. These are actually the second pair I've had in the same colour. They are cheap workhorse type shoes, but ever so comfortable. The first pair I had for several years. Particularly in winter they were worn many times. I was devastated on my birthday a couple of years ago when everything was falling apart at home to find when I reached the bus stop on a very rainy day, that the sole of one had split across the bottom, let in heaps of water and the colour had run all over a good pair of my handknit socks. As I'd been expecting a lift to the bus stop at the very least on my birthday, it was all too much and I stood there in the rain, waiting for the bus with tears running down my face. The shoes are American, Thomas McCann, and actually come from KMart of all places. I haunted the place for a while but they had no more in that colour and I didn't like the brown. I was in there last week, walked past the shoes and there they were. My size too. A bonus was that they were cheaper than eight years ago. I guess that's because our dollar is stronger now. I put them on when I arrived home and it was as if I'd been wearing them for years. Proper fit, no rubbing or blisters at all. Cheap enough to wear around the house but so far, decent enough to go shopping in. Like many whose blogs I read, I've always loved red shoes. These are supremely comfortable and the strap at the side of this pair means I can adjust the fit on days when the arthritis makes my feet swell. They are soft underneath but with a firm base to the softness. Another pair I've always been able to wear with no problems. Now the humidity is easing, the arthritis in my feet is also easing. It's been worse this year than in any year for the last ten years or so. My toes and under the instep are no longer swollen but my ankles still have some puffiness. It's going but there's still a remainder. I look at this and wonder where my very trim ankles of last year have gone. There's some misshapen ankle bones under the puffiness, a legacy I presume of whacks from a hockey stick in my teenage years. I was at Sydney Uni in the days of the old Fisher library and in the early years of the new building. Those wearing shoes with heels small than a 10 cent piece were required to take them off in the new library to save damaging the new floor. I came back to my desk after looking for a book to find a note left for me. I asked the writer later how she knew it was my desk. She said she knew that such pretty new red shoes left on the floor just had to be mine! One down, one to go. This lovely pattern is from Ailsa. She says it's based on an origami fold, nothing to do with mountains at all. However, the folds do remind me of the folds in the Great Dividing Range, particularly further south from Sydney around Picton sort of area. The Blue Mountains west of Sydney are not mountains at all but the remains of an upthrust plateau. The Dividing Range has folds of mountains, one on top of the other. The yarn is sockwool from Needlefood in NZ. The colour is orange butter cake. Done on KP 2.5 Harmony needles. I did a short row heel because I really do find them more comfortable on my low arch, flat instep feet. I preferred the look of Ailsa's gusset and heel flap, their triangular gusset complemented the triangular sections in the pattern, but they will go on my feet and I know what suits them. We had a lovely family picnic yesterday at Pearl Beach on the central coast. It was to mark a year since Mum's death. Her 90th birthday would have been just a few days ago. All the grandchildren swam for quite a long time. The water was pleasant but there was a cool breeze blowing over the beach. I've known and loved Pearl Beach since I was about six. I've spent many happy holidays there. It's changed, in many ways not to my liking, but it's still beautiful. We took all the children around the rocks past the baths in the afternoon. I think I know practically every nook and cranny and rockpool there and I've actually walked and climbed all the way to Patonga around the water. They had a marvellous time discovering all sorts of creatures and seaweeds in the pools. The tide was quite low, so they could get down to the edge of the rock platform. Four year old Finn thought he was very brave. He touched a crab in a pool. He was sure it was alive, but it was upside down and floating, so I doubt it! Someone turned a starfish upside down and they watched fascinated as it righted itself. On a not so happy note was the news that my son took Miss Seven t the doctor because she appeared to have a wart on her foot. They have a specialist appointment in a a week or so, but the probability is that it's something very much more sinister than a wart. The good news is that treatment is usually successful, but it's very worrying, nevertheless. This probably may seem an easy way out and perhaps it is, but I really like this picture which I took some years ago. I'm a big fan of Macs but I don't like iPhoto much. 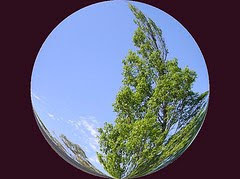 I find organising and editing photos far easier on a PC using Photoshop and have found nothing quite like it for a Mac. So here's a photo I took of a tree on a windy day with just a touch of editing. I'm also not very fond of iCal, preferring to use the calendar in Gmail. I make calendar entries on both my phone and in Gmail and sync them together with Bluetooth. Until I bought this computer, I had to use a USB stick to work the Bluetooth for my computer. This model comes with all the bells and whistles, including that, so it's easy. Another big plus for the Mac is Time Machine which must be the easiest way ever to back up all settings and files on your computer. A big external drive is needed. The Mac sets it all up automatically and everything is backed up several times a day. I have a 500Gigabyte external drive but could have bought a terabyte. Everyone I've spoken to about this recommends it for Macs. Restoration, if ever needed, is apparently easy, accurate and quick and you can choose the date wanted to restore the computer to. It just sits there and works at chosen times of the day. If the disk is ever filled, it will start deleting the files from the earliest dates or a new disk can be installed. Just brilliant and a load off my mind as regarding photos and documents, old assignments and most importantly, knitting patterns! Ailsa released a new sock pattern called Mountain Fold after an origami fold. It will be a couple of days before I can get to the PO box to hopefully pick up the first instalment of her next yarn club, Black Nights of Japan, I think it's called. Haven't checked that so I could well have it wrong. I picked up some sock wool from Michelle at Needlefood. The colour is orange butter cake. It shows the pattern well. The pattern requires some accurate counting till the sequence is established. Notice I said accurate. Draw your own conclusions from that! It's actually an easy pattern. There are twenty two pattern rows each repeated a second time. You'd see it better if it were flatter but I was getting the best light I could after 4:00 pm and it's resting on the top bar of the railing outside my doors. The pattern is enticing. It drew me in. "Just another two rows" was similar to "one more chapter" as I used to say to my parents when my light should have been out. I'm down to the heel and will probably do a short row heel as that suits my feet better than a heel flap. I think autumn may have decided to finally arrive. Mornings and evenings have been cool and woolly socks seem attractive to my toes this evening. I rarely wear shoes inside here. Monday evening update I said little about the jacket before because another person was involved. However, she's given me the all clear, so here's more detail. Many of you will know Ailsa from Knitabulous. She does beautiful knitting and also sells some lovely yarns in amazing colours. I was a member of her yarn club which finished a few weeks ago and signed up immediately the next one opened. The yarn is beautiful and Ailsa works with high standards of ethics. A few weeks ago she wrote to me asking if I would test knit some new yarn for her. Sock yarn. She asked me to make the Baby Sweater by Elizabeth Zimmermann for her. This is the result. Keep an eye on Ailsa's blog and Etsy shop for the release of this yarn. Probably early May. It's great and for more than socks. I did the jacket on 3.5 mm but think the yarn would still be lovely knitted on much smaller needles for socks. For a start, there are 115 gm in the skein, over 400 metres, lots for socks. 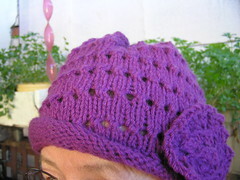 I used the original KnitPick metal circular needles and the yarn just glided along. I found it almost impossible to split, even when I wasn't watching well. The pattern shows nicely. It's consistently spun and plied. I've used too many expensive wools which in spots are thick and thin, something I might spin. One wool I used recently had hard little lumps still firmly attached to the yarn. A shame I wasn't knitting nupps in that pattern, they were there ready made. Nothing like that in this wool at all. I would envy any baby dressed in something from this yarn. I was knitting one of the cool mornings in the last week. My fingers were luxuriating in the softness, the squishiness and cosiness of the garment. As I said to Ailsa, it was like comfort food, very addictive and totally pleasant. So this update expands on the who, what, when where and why comment I made at the end of the post. So here's what I've been working on for the last week. 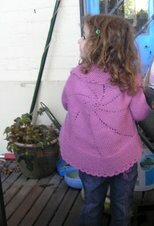 It's Elizabeth Zimmerman's February Baby Sweater from The Knitters Almanac. I've done two adult jackets, Liesl, by Ysolda Teague which is done on similar percentage numbers, but somehow the baby version has passed me by. I was asked to do this a few weeks ago and the yarn arrived early in the week. The bottom jacket is perhaps somewhat more accurate in colour. I've photographed several things in similar shades in the last 18 months or so and it's always been difficult to get an accurate reproduction. This is hot off the needles, no blocking done yet in any shape or form. The buttons were part of the large collection given me by a friend from his mother who was a dressmaker. Three were some really wonderful vintage glass buttons which would have looked fantastic on this. Unfortunately most of the designs had only three buttons. One had four, but I'd made five buttonholes. These buttons are at least twenty years old. Friend's mum died twelve years ago and had Alzheimers disease for at least twelve years before that. You know the instructions to read through the pattern first? Well, I did that. One part did not make an impression on me at first. This is possibly due to the way the pattern, or instructions rather, were written. It's not really a pattern, more a series of ideas strung together. It speaks of the yoke being done and then mentions the buttonholes. The picture in the book clearly shows buttons from the top of the yoke. As I went to do my first buttonhole which was after I'd finished the yoke, the penny dropped. I had to rip it all back and start again. I need to remind myself to read the pattern with some degree of comprehension, understanding just what the pattern really means. More details on who, what, where, when and why to follow later. Here's my Saturday camera. Well, it's Monday today so it's a bit late, but the photo was taken on Saturday. That must count for some brownie points, I guess? The weather is finally beginning to cool down ever so slightly and the nights have been better for sleeping. Here's little Sweetpea taking advantage of some sunshine in the small sunroom off son's and DIL's bedroom. It's a bit hard to see because of the play of light and shade, but she's actually quite twisted like a corkscrew. The bit of her in the sunny patch is at right angles to her head so she can get the sun on her tummy. Then there's more of a twist to the legs. Add in the arch like a ballerina and the fact that she's also raised by lying on the base of the fan, and she looks very uncomfortable to me. However both DIL and I took several photos and she didn't stir, even at the click of the camera. That's unusual for her, so she was very soundly asleep. It's the Easter holiday weekend and we've spent it fairly quietly. Church on Friday and then yesterday again and I had lunch at church afterwards. There are quite a few different nationalities in the congregation so there was a lot of variety in the foods brought. I tasted a lot, usually just about a teaspoonful of each. Most, especially the homecooked Thai and Indian dishes were really delicious, much better than commercial stuff. Mind you, it was a bit difficult to work out what some were. There were labels but they weren't a lot of help when the cook's English was scratchy. I took the easy way out. As I'm new there, have been there since Christmas, I didn't know what people would bring. I baked a chicken and then took it apart when cold and served it on a greek salad. It went too and there was a great variety of food. As far as knitting goes, I've had a bit of a mixed week. The Bendigo Melody, very similar to Heirloom cashmino is beautiful to work with and the stitch definition is great. However, I've been reminded twice of the 60s song When will they ever learn? The answer is blowing in the wind. See tags telling of frustration and frogging. Twice I was working with the Melody on a shawl. Twice I've had to pick back several rows, stitch by stitch. I have no idea what happened the first time except that I made a mistake and then somehow fudged a correction. I didn't even see it till I spread the shawl out for a look and there it was, about ten rows down, standing out like a sore thumb. So that had to come out. The second was after a great day working on it. I continued in the early evening as it became dark, even though I had the light on. I was tired but kept going although my brain was saying to stop. That was a recipe for disaster. On shawls and other lacy things, I use stitch markers, often lots of them. I use a distinctively different stitch marker as the first marker for the right side rows. I was going along on the shawl and congratulating myself on the progress when I realised that somehow I had managed to duplicate a WS row and was now working the pattern on the back of the shawl. I was disgusted. I picked back two rows and put it aside. In the daylight I could see I need to unpick another four rows to get back to doing it properly. So frogging and frustration. I've started a slip stitch hat for #2 son. I have a birthday present for his wife and some knitted things for each of the children. I thought I'd better do something for him too. It's easy but slow and I'm using 3.5 needles on 8 ply wool so fabric is very sturdy. Grey and black which look good together.